I haven't had much time to work on the layout lately, as I have been crunching on finishing a book project. 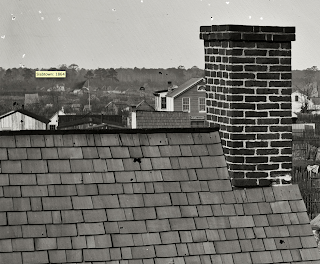 I did find a photo showing a close up of how civil war era builders finished the wood roof shingles at the ridge cap. The last course of shingles sticks up (stands proud) of the ridge cap. Also note the random width shingles, though no two seams overlap and that only some nails are visible. I do not see any evidence of flashing around the chimney. On the motive power front, another 4-4-0 Mason arrived on the property. This one is the Whiton, another SMR offering. It doesn't run as smoothly as my other engines, so some tuning will be necessary. But its green paint scheme is very attractive.